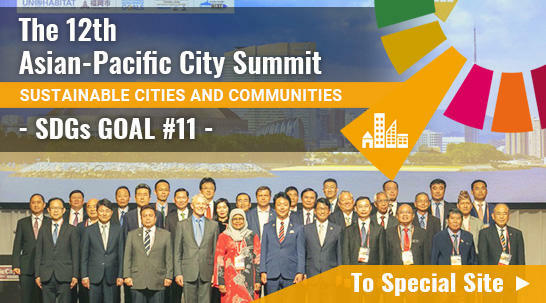 With a view to "building a close collaboration network among the cities of the Asian-Pacific region" for the purpose of solving urban problems, the 3rd Asian-Pacific City Summit was held in Fukuoka, Japan, from July 11 (Sat.) through 12 (Sun. ), 1998. Welcoming Brisbane, Australia, and Honolulu, U.S.A., both major cities in the Pacific region, as the new participating members, the Summit this time was able to have the largest attendance ever, with leaders of 23 cities from 12 countries and regions. We had the honor of the presence of Mr. Yasushi Akashi, former Deputy Secretary General of the United Nations, who gave the keynote speech. With the cooperation of the United Nations, we were able to have a lively, Significant exchange of ideas. Through the two Asian-Pacific City Summits held in the past, in 1994 and in 1996, we were able to deepen mutual understanding, strengthen the "relationship and confirm the importance of international exchanges. Based on the results so far achieved and fully aware of the necessity to pursue multilateral cooperation among the cities, we, in the 3rd Summit, were able to further deepen our discussions on measures for solving various problems faced by cities and on their collaboration toward the future. At the closing of the 3rd Asian-Pacific City Summit, we hereby present the "Fukuoka Declaration" based on the mutual and common understandings reached in the meeting. This will serve as a key to open up the future of the Asian-Pacific region. 1. Cities in the Asian-Pacific region have made developments following spectacular economic growth in the region, despite multitudinous problems. However, the recent economic crisis in Asia has created social instability and the cities are now faced with the question of how these new problems can be overcome and which road is to be taken for future development. In order to find a way out of such a crisis and achieve sustainable development among the cities in the Asia-Pacific region, it is imperative to future expand and deepen exchanges and collaboration among the cities. It is more than ever required of each city to have the spirit of mutual cooperation and complement to share the resources possessed respectively by the cities while mutually understanding the differences that exist among them. 2. For that purpose, it is important to promote exchange of information, sharing of wisdom and nurturing of human resources as well as build and strengthen collaboration network, by leaping beyond national boundaries and maintaining "face to face" exchanges among the cities. 3. Besides the problems related to "transportation" and "environment" which were already discussed in the previous two Summits and Working Level Conferences, there exist piles of multifarious urban problems such as those related to "education," "health and medical systems," and "waterworks and sewer systems," which were the themes of this Summit. The problems are intertwined in such a complex way that they are difficult to be solved by a country or city alone. It may be along way for us to be able to achieve multiple, systematic solutions. However, we are ready to exert all our efforts toward solving the problems. 4. We are determined to perpetuate the Asian-Pacific City Summit, which is the actual proof of our network. Taking as many opportunities as possible in the spirit of mutual support and reciprocity, we are determined to steadfastly promote cooperation among multifarious cities, together with the cooperation of the United Nations and other concerned organizations and groups. 5. We will hold the 4th Asian-Pacific City Summit in Pusan, Republic of Korea, two years from in the year 2000. As a core of active inter-city cooperation, we will hold the 3rd Working Level Conference next year in 1999 in Fukuoka. We sincerely hope that the Asian-Pacific City Summit will see further development and that its results, spreading like a ripple, will contribute to the prosperity and peace of the Asian-Pacific region in the coming new century.